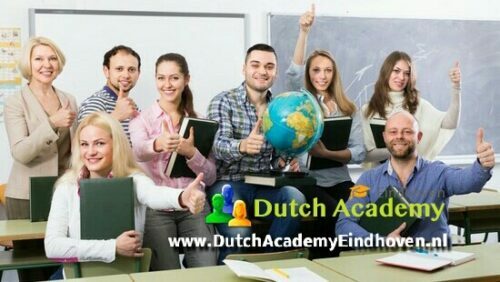 Dutch Academy Eindhoven offers intensive Dutch language courses to highly educated foreigners who are non-native speakers. This intensive Dutch course is intended for absolute beginners. During the course, you will learn to communicate in Dutch in everyday situations. Throughout the course priority is given to understanding and producing basic spoken Dutch for survival. In this intensive Dutch course, students deal with the entire elementary grammar of Dutch and build up a vocabulary of about 1.000 words within 9 weeks. The course concludes with a final online test. When you complete your Dutch course, you will receive a certificate of Dutch Academy Eindhoven. The course activities are founded upon various tasks. These tasks are functional, and are directly linked to a concrete situation, such as ‘having conversations with people on the street’ or ‘a basic job interview’. By using multimedia, the teacher provides learners with opportunities to develop the four language skills; listening, reading, writing and speaking. Category: Finished Dutch Course Eindhoven Tag: Fully booked!